I saw this book on the shelves at Barnes and Noble. My immediate reaction was negative and visceral, “Oh great, now we’re going to teach cheating to the masses.” I picked up a copy at my local library to learn more. To my relief, this isn’t a book about how to engage in questionable business practices. It is a prescription for success borne out of Silicon Valley—a culture characterized by aggressive, badass behavior. Wong is a prototypical tech CEO: brilliant (he skipped four grades to go straight to college at 14), extremely confident, and insanely ambitious. Aware of the gender gap in tech and in Silicon Valley, and the underlying culture that perpetuates it, I really wanted to not like this writer or his book. But I can’t, this guy has brights and balls and, with boundaries, I love that. -Be Ballsy: Learn how to get to the bolder version of yourself. -Be You: Remember: you are your greatest asset. -Be a Trailblazer: conventional wisdom is dead. There are better ways to get ahead. 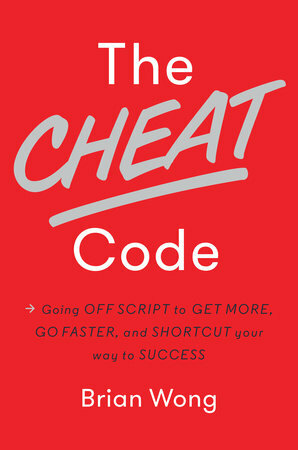 Each section is comprised of a series of “cheats” – short, clever, tips for success. Collectively, they can overwhelm the senses (there’s a lot to digest) but taken singly, most are incredibly insightful, bold, and useful. Like this one: “Know Your Superpower!” We all have at least one thing that we do better than everyone else. The best approach to fast track your success? Know and leverage that which makes you uniquely you, and differentiates you from all others. Focusing on breadth over depth, the book reads like a series of soundbites but, make no mistake, there’s a lot to be learned. Yup, Mr. Wong, you’ve expanded my view and shifted my perceptions. And for that, I give thanks.